It's no secret that HTC is struggling. In the past year alone, the company lost several key players on its executive team and posted a net loss of about $101 million. Based on that criteria alone, the forecast looks grim for the Taiwan-based phone manufacturer, and the plan to get its business back on track is seems to be to just keep repackaging its one phone that made headlines, the HTC One. It began with the One Mini, which we reviewed a while back, and now the trend continues with the One Max, HTC's phone-tablet hybrid. It boasts a 1080p screen, updated version of Sense UI 5, impressive low-light photography abilities, and a long-lasting battery life. It all looks good on paper, but once you use it, you just realize it's just a much bigger HTC One. Given the name, I suppose that's what we should expect. The One Max is almost a carbon copy of its predecessor, albeit a bit heftier. It features the same aluminum chassis signature to the One, along with a white plastic accent around the edges. Both the power and volume buttons reside on the right side of the One Max so that you can easily access them with your thumb. The One Max also features a tiny switch that pops open the back cover, revealing the MicroSIM and MicroSD expansion slots, as well as a battery pack that can't be removed. Putting the cover back on was a task and required that I held on to the latch while I placed the door back in its hinges. HTC should have stuck with the pull-and-pry-open method, like the one featured on the Galaxy Note 3. The One Max requires two hands most of the time, but it's not too wide that you can't grip it with one. I didn't feel self-conscious using the phone out in public as I did with the Lumia 1520, but I did feel awkward walking with it in my coat pocket. Other colleagues claimed they didn't mind the weight of it too much. At 217 grams (about 7 ounces), the Max's heavier body is a bit of a departure from the lighter, thinner One. 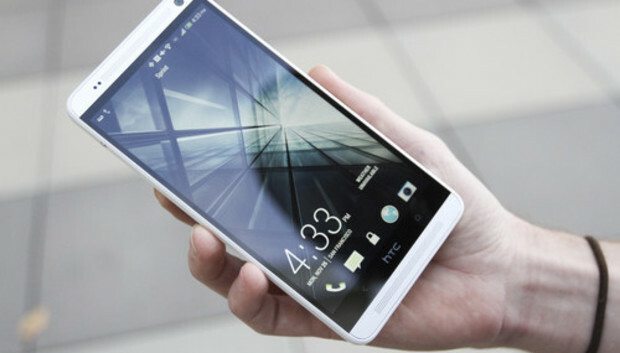 HTC stuck with a Super LCD panel for the One Max's 5.9-inch 1080p display. It features 367 pixels-per-inch (ppi) and natural-looking colors that aren't oversaturated like the Note 3's Super AMOLED. Its viewing angles are fine for watching videos with a friend and the device can be easily used outside in the bright light, just as long as the display is set at a high brightness. With 2GB of RAM and a 1.7GHz Qualcomm Snapdragon 600 processor, the Max's specifications are the same as its older sibling, the One. That puts it behind the latest phone releases, like the LG G2 and the Galaxy Note 3, which both boast the latest Snapdragon 800 processor. That's not to say that the One Max isn't capable: apps ran smoothly, video didn't stutter, and games like Prince of Persia: Shadow & Flame loaded quickly. The slightly older processor is just another indicator of HTC's current strategy, which is to repackage its leftovers and sell it as the latest and greatest. At least the One Max's battery life is impressive. In our video streaming tests, its 3,300mAh battery pack lasted about 11 hours and 4 minutes, clinging on to 4 percent of its battery life for about an hour before it eventually petered out. There is also a power saving mode that you can engage and the One Max lasted about 27 hours of varied use with this setting on. Like the HTC One, the One Max maintains the legacy of the rear-facing camera with the company's "UltraPixels" technology--it's sssentially an enhanced 4-megapixel camera sensor. Its photos came out clear with vibrant colors, though there were some instances when photos appeared a little less saturated than normal. You'll also start to see the limitation of the UltraPixel sensor when you zoom into a photo, as exhibited below. I liked the One Max for things like Instagramming and snapping quick photos to document my life, and it did especially well with low-light situations and moving targets, but the low resolution makes it hard to count on as your sole camera. HTC announced the much-anticipated Sense UI update when it introduced the One Max last month. Sense 5.5 is based on Android 4.3 Jelly Bean and comes with several features and tweaks that users ached for in the HTC One, including the ability to wipe BlinkFeed from the Home screen entirely. You'll also see an extra row of icons in the application drawer on the One Max, as well as a few new themes and a reorganized Settings panel. BlinkFeed got a bit of a boost itself, too, like the ability to add sources via RSS and through Google+. There's also the new Do Not Disturb mode to mute incoming calls and notifications. You can block certain contacts and messages and set a frame of time when data should be turned off. When the iPhone 5S was announced with a fingerprint scanner, I admit that I thought the concept was rather gimmicky. The HTC One Max's own implementation of the technology doesn't do much to sway me, either. From the Settings panel, you can set it up so that three fingers can perform one of five different actions, including unlocking the phone, launching the camera, or bringing up the Home screen. I didn't particularly enjoy having to scan my finger each time I wanted to unlock the phone, and most of the time it couldn't read my print unless I swiped it exactly how I recorded it beforehand. It becomes frustrating when you're trying to unlock the phone just to get one measly little thing. At least the iPhone's fingerprint scanner makes sense because it's embedded into a button that's commonly used, rather than hanging out on the back of the device like an afterthought. The One Max doesn't have any glaring flaws, except that it's basically a reprise of the HTC One with a few new minor features. Regardless, the device is the whole package: speedy processor, capable camera, 1080p screen, and a custom Android interface that looks like someone actually spent some time designing and curating an interface fit for a phone. It's still a really big device, however, and if your phone is often a pocket-dweller I'd suggest just sticking to the original One, especially since it will eventually receive the Sense 5.5 update. Whether the One Max will do anything for HTC's sales numbers is another thing entirely. The biggest roadblock for HTC right now is not only its notoriety, but cracking Samsung's stronghold in the Android market. Unfortunately, that's not something that a gargantuan aluminum-encased version of the phone that was hot six months ago is likely to address.